OTTAWA (CUP) — In a bid to foster job creation, the Conservative budget, presented on Feb. 11, took a student and training focus. Aiming to ease debt loads and address a “skills mismatch,” the Economic Action Plan introduced new programs and changes in funding to existing government initiatives like apprenticeships, internships and research funding. 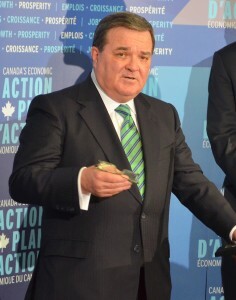 “Creating jobs and opportunities remains our government’s top priority,” said Finance Minister Jim Flaherty in his budget speech to the House of Commons. In an initiative to train new workers for available jobs, the Economic Action Plan 2014 announced changes to the Canada Job Grant program, which was created with the last year’s budget. The new program will be launched this year and direct up to $15,000 per trainee in funding from the government and employer. Since its introduction the program was met with pushback by the provinces, who were originally asked to provide $5,000 of the $15,000 funding. Tom Mulcair is also skeptical. “This cannot be done without the provinces,” he said to journalists on Parliament Hill. While employers are still responsible for providing a third of the grant, the budget says if provinces refuse to negotiate an agreement, the remainder of the funding will be provided directly through Service Canada. Employers will also be able to provide their share of the grant through wages, reducing the burden of coming up with $5,000 up front. “Anytime interest-free loans are made available to students it’s a positive step,” said Jon Champagne, Canadian Alliance of Student Associations (CASA) national director. Canadian Federation of Students (CFS) national chairperson Jessica McCormick was not as happy with the new loans program. She said rather than adding to the constantly growing student debt in the country, the government needs to allocate funds to grants and non-repayable assistance. Another project, the Flexibility and Innovation in Apprenticeship and Technical Training, is aimed at encouraging innovative training techniques for technical apprentice training. While only a pilot project, the FIATT will have the ability to support 12 multi-year programs implementing training techniques such as simulators, video conferencing and online learning. FIATT will see $13 million in funding over four years, starting this year. The Youth Employment Strategy overseen by the government annually receives $300 million for skills and experience acquisition. The government will review the program to “align it with the evolving realities of the job market.” According to the budget the program will likely focus on science, technology, engineering, math and skilled trade sectors. Flaherty said the government is on track to balancing the budget next year as projected. “We don’t want to pass on our debts to future generations,” he said.